The abolitionist crusader John Brown died on December 2, 1859, executed by the state of Virginia for charges relating to treason, murder, and promoting a slave insurrection. Although Brown's public execution took place before the start of the U.S. Civil War, his life and death anticipated the impending battle between the North and the South over the moral legitimacy of slavery in America, and served as a source of righteous inspiration for both sides immediately before and during the course of the war. Beyond that, Brown's death serves as a case study in the construction and power of martyrdom. Proslavery supporters reviled Brown, whose often bloody actions against the social institution fueled southern fears about northern aggression. Many supporters and fervent abolitionists, on the other hand, glorified Brown, whose sacrifice for a higher good transformed the unsuccessful businessman into a national martyr. Born in Connecticut on May 9, 1800, Brown became involved in the abolitionist movement early in life. His father was a strict Calvinist who abhorred slavery as a particularly destructive sin against God. Brown himself witnessed the brutality of slavery when, as a twelve-year-old boy, he saw a young slave ferociously beaten with a shovel by his owner, an image that remained with Brown for the rest of his life. After the Illinois abolitionist publisher Elijah Lovejoy was murdered by a proslavery mob in 1837, Brown publicly declared his intention to find a way to end slavery in the United States. In the midst of extreme economic hardships and failed business ventures, Brown moved with some of his sons to Kansas following the passage of the Kansas-Nebraska Act. This act, heavily supported by southern slave-holding states, allowed people in new territories to vote on the question of slavery. During the 1850s, Kansas was the scene of a number of horrific acts of violence from groups on both sides of the issue. Brown placed himself in the thick of these bloody conflicts and, with a group of other like-minded zealots, hacked five proslavery men to death with broadswords, an event that came to be known as the Pottawatomie Massacre. In the summer of 1859, Brown led a small army of men, including his own sons, to Harper's Ferry, Virginia, with a plan to invade the South and incite a slave rebellion. The group successfully raided the armory at Harper's Ferry but, after the arrival of Colonel Robert E. Lee and his troops, Brown's plans fell apart, and his men either escaped, died, or were captured by Lee's men in the ensuing battle. Brown himself was captured and stood trial in Virginia, where his fate was determined by an unsympathetic jury. Brown, however, did not understand his failed invasion and impending death as a defeat for the abolitionist cause. Instead, he believed these events had crucial historical and religious significance, and that rather than signaling an end would be the beginning of the eventual elimination of slavery in America. Brown greatly admired stories about the prophets in the Bible, and came to believe that God, rather than a Virginia jury, had determined his fate. Convinced that his martyrdom could have more of an impact than any of his earlier schemes, Brown faced death with calm assurance and optimism that an abolitionist victory was secured with his imminent execution. Brown was not the only one who understood the significant political implications of his execution in religious terms. Indeed, major northern abolitionists who would not countenance Brown's violent strategies to end slavery while alive, embraced the language of martyrdom after his death on the gallows. New England cultural figures like Ralph Waldo Emerson, Henry David Thoreau, and Lydia Maria Child, to name a few, identified Brown as the first true abolitionist martyr, serving as an iconic symbol of righteousness, redemption, and regeneration. 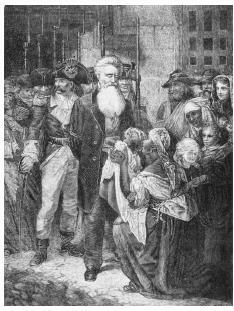 Although others perished with him on the gallows, for many northerners John Brown was transformed into a hero who deserved to be included in the pantheon of great Americans and who died for the good of the United States. Abolitionist John Brown, being escorted from prison to his execution in Virginia, 1859. His death foreshadowed the approaching battle between the North and the South over the morality of slavery. body aroused a great deal of interest. In Philadelphia, a large crowd of people from African-American abolitionist and proslavery communities turned out to meet the body upon its arrival in the city. The mayor, along with Mary Brown and her supporters, feared a riot might ensue, and decided to send an empty coffin to the local undertaker as a decoy so the container with Brown's body could make it to the wharf and continue its journey by boat to New York City. Reaching its final destination, people came to see the coffin containing Brown's body, with some towns finding various ways to commemorate the martyr while the corpse passed through. On December 7, 1859, Brown's body arrived in North Elba, and was laid out in the front room of the house for visiting relatives, friends, and supporters to see before it vanished for good after the funeral the next day. After the corpse of John Brown had been placed in the ground at his home, the memory of his violent campaign to end slavery and the symbolism of his death in the state of Virginia continued to materialize in American imaginative and social landscapes. During the U.S. Civil War, for example, one of the most popular songs among Union forces urged soldiers to remember his body "a-mouldering in the grave"—in time, a song that would be transformed with new lyrics by Julia Ward Howe into "The Battle Hymn of the Republic." The cultural memory of John Brown's life after the war and into the twentieth century assumed a variety of forms, including Stephen Vincent Benét's famous Pulitzer Prize–winning poem, "John Brown's Body," and the establishment of schools bearing his name. Oates, Stephen B. To Purge This Land with Blood: A Biography of John Brown. New York: Harper and Row, 1970.